Salt gets a bad press. I know it’s responsible for the untold misery of heart disease, high blood pressure and a thousand other fairly major medical complaints, but it also has a near mythical ability to preserve food and concentrate flavour, the closest thing to culinary alchemy there is. This duck prosciutto, a ham born through nothing more than the application of salt to a duck breast, is simplicity itself, and at no more than five minutes work, spread over a few days, it’s a great introduction to the magical world of charcuterie. First, make a basic curing mixture of 300g of rough sea salt and 300g of golden caster sugar. Add a small handful of rosemary leaves, bashed up and bruised a little in a pestle and mortar, or just chopped through on a board, along with three or four crushed juniper berries and three peeled and squashed cloves of garlic. Crush half a teaspoon of coriander seeds, a single clove, half a teaspoon of black peppercorns and a star anise together in the pestle and mortar and stir into the salt and sugar mix. Sprinkle the cure over two plump duck breasts in a non-reactive bowl. A plastic box is best, small enough to contain the duck breasts neatly. Put the box in the fridge and leave for three days. The salt will work it’s magic, drawing out the duck’s moisture and gently drying it out. The cure will turn to a brine, and the meat will darken. After three days, rinse the breasts under cold running water and pat dry on a tea towel before individually wrapping and tying them in muslin. Hang the duck in a cool, airy place for a week to dry – a dry cellar or a shed or garage would be ideal. To serve, slice the ham at an angle, as thinly as possible. The ham tastes delicate and mellow, sweet and not at all salty. There are hints of juniper and rosemary. This is truly brilliant. I'm making it next week. Helen – thanks. Do try it. You won't be disappointed. Now there's something different – sounds and looks divine….good work!! Boy, I want to buy the book now.. Would u recommend it? Love prosciutto, but haven't tried duck…thanks..will do soon. Rich, thank you for this. I have the book and the recipe is rather ambivalent. Tish and Tom say 4 mallard or farmed duck breasts; farmed duck will be much bigger and they also don't say whether it should be 4 mallard breasts or the breasts from 4 mallard (ie 8 breasts). Anyway, have just started your version. 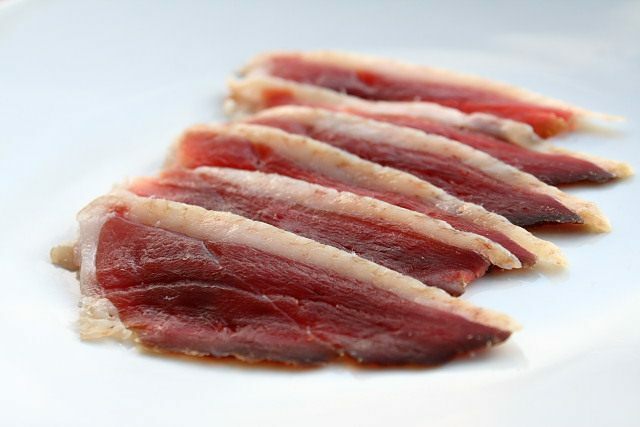 Cured duck breast is one of the easiest and most successful ways of starting your charcuterie experiments, the meat with a little fat lends itself perfectly to the curing process, how about trying smoked duck breast next in your own biscuit tin smoker! 300g each of salt and sugar?? Surely this is a typo and you mean 30g each of salt and sugar? Nope, 300g each of salt and sugar is correct … the aim is to cure the meat, not to season it. Most of that lot is washed away at the end. Really? Well how come I and everybody else cure bacon at 25grams of salt for every kilo (1000grams) of pork? You’re not going to eat the cure, so it doesn’t really matter how much of it you use. I’d suggest that 25g is nowhere near enough to cure a kilo of pork, though.